First flown on 7th January 1959, she served with the Gutersloh and Jever Station Flights and 229 OCU at Brawdy. Acquired by the museum at Carernarfon after retirement she stood guard there for many years, wearing a green and grey scheme (which soon turned brown and grey!). In 2007 she was repainted in red/white/grey trainer colours. 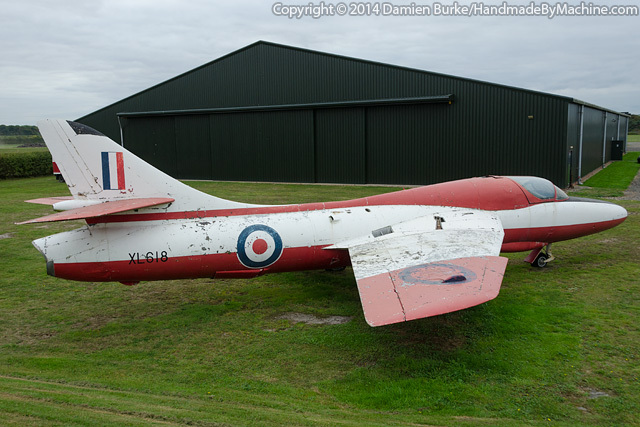 With little warning she was then placed under threat of being scrapped in May 2014 but happily was rescued by Lakes Lightnings who have transported her to Newark and placed her on loan to the Newark Air Museum. Sadly her years by the sea have done her no favours and there is substantial corrosion in the undercarriage bays and wing attachment areas. The cockpit is partially stripped but what remains isn't in that bad condition given the state of some other areas of the airframe - I suspect the result will be that eventually she's reduced to a nose section as the amount of restoration work necessary on the complete airframe is probably beyond reasonable cost.